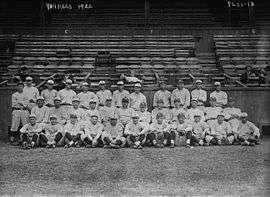 The 1922 New York Yankees season was the 20th season for the Yankees in New York and their 22nd overall. The team finished with a record of 94 wins and 60 losses, to win their second pennant in franchise history, by a single game over the St. Louis Browns. New York was managed by Miller Huggins. Their home games were played at the Polo Grounds. In the 1922 World Series, the Yankees again lost to their landlords, the New York Giants, 4 games to none with one tied game. The final game of the Series was also the Yankees' final game as a tenant in the Polo Grounds. During the season, they had begun construction of their new home, Yankee Stadium, which would open in 1923. The Yankees started the season without their star, Babe Ruth, who was serving a suspension due to breaking the rule (along with several other Yankees) against World Series participants barnstorming. Although Commissioner Landis refused to back down on his enforcement of the rule, he did repeal the seemingly absurd rule by the end of the 1922 season.